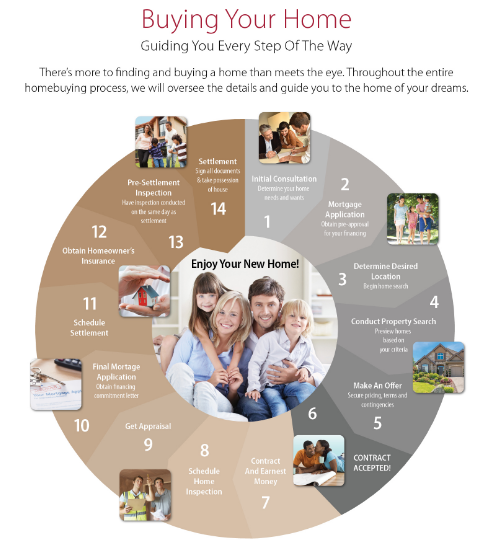 The home buying process can be a very overwhelming experience, especially for first time homebuyers. The best way to attack this process is to take it in chunks. Here are 3 manageable phases. During the “ready” phase you investigate the financing part of the process. Your assets, liabilities, income etc… It is important to take the time during this phase to understand different loan options, and get an idea for an estimated payment at different price ranges. This is the most important part of the process! Once you know your buying power and reach a payment that is comfortable for you, it’s time to work on location. Where do you work? Consider commute time, lifestyle, and where you see yourself living. How many bedrooms? What type of home do you want? Condo, townhome, single family? Do you care for Home Owners Associations? Wood floors? Gas Heat? Once you have reached your search timeline (about 8-10 weeks before you want to move) let’s hit the pavement! By now you have done a lot of online searching on my site, you have visited some open houses and its time to get serious! All the pieces come together when you walk into the home and say…”This is it!” I am astounded weekly on how this process works. Whether it is home #1 you visit, or #41….when you know, you know! It’s so nice to focus on the home once you get to this stage of the process vs. scrambling to get a preapproval and find out if you can afford the home. Put Ready, Set, Go to the test!